I’ve been a big fan of Anne Eliot ever since I read Unmaking Hunter Kennedy, which was just a really sweet, really fun read. So, when I saw that she was going to be signing at BEA, I jumped at the chance to meet her. I thought I’d just be getting a signed copy of Unmaking, but was really happily surprised to see find out that she was giving away ARCs of her newest book as well. Of course, I happily accepted this one and I’m so glad I did! 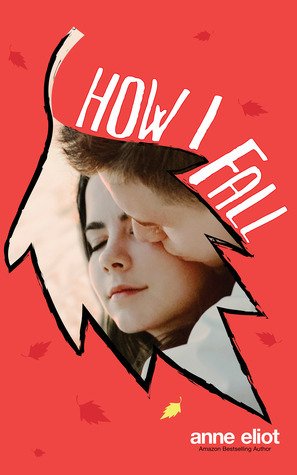 How I Fall was a delightful read that focused on the trials (and joys) of a teenage girl with CP. One thing that I love about Eliot is the way that she always integrates some sort of issue into her books. Unmaking dealt with depression (though it wasn’t necessarily the center of the book) and Almost dealt with PTSD after a near-sexual assault. This book tackles a different sort of issue – living life with a disability. See, what the synopsis doesn’t mention is that Ellen, the main character, has mild CP. She has struggled her whole life to overcome her disability, working incredibly hard to gain mobility and to put her limitations behind her. But, no matter what she does, she can never quite get to “normal” and she can’t force the people around her to see her as anything more than the “handicapped girl” who needs special care. The book explored how Ellen felt about herself and her own limitations as well as how others saw her. Life was a struggle for Ellen, but she did NOT live her life as a victim – she constantly pushed herself and focused on her dreams rather than the things that held her back. While Ellen was a fantastic main character, there were lots of amazing supporting characters that shaped her story too! First off, Ellen’s best friend Patrick, who was a constant in her life. He was very protective of Ellen, but also incredibly supportive. I appreciated that Eliot portrayed a solid friendship between these two characters and didn’t feel the need to turn them into a couple. Then there was Laura – the new girl who’s referenced in the synopsis. Laura was sort of a force to be reckoned with – bubbly, full of positive energy and very quirky (and Irish to boot!). She added a breath of fresh air to the story and was really the driving force that brought Cam and Ellen together. Speaking of Cam – he was kind of the perfect boy. Sweet, good looking, popular – if a little quiet. We find out right away that Cam had been harboring a secret crush on Ellen for a very long time. He admired her strength in adversity and shared a love of photography with her, all of which drew him to her. Cam had his own struggles, giving his character a bit more depth – he wanted desperately to escape his father’s control over his life. All of these characters impacted Ellen’s life in major ways, and I formed attachments to all of them as the story progressed! The book ended with a cliffhanger after a major, unexpected event. Now I can’t wait to get my hands on book #2! There were times when I felt like maybe Cam was a little too perfect (the super popular football player who’s really incredibly sensitive and has a crush on Ellen despite – or because of – her disabilities). I also occasionally thought that Laura seemed almost a bit too perky and adorable. But these were minor complaints. I think that this book was perfect for the younger YA set. I loved the story and thought that it was a realistic and engaging portrayal of living with a disability. I highly recommend it! 4.5/5 stars. Sign into Goodreads to see if any of your friends have read How I Fall. 21.9% "I love this - Ellen is dazed by the attention of her crush, Cam, and thinks:\n *Ellen, with only two remaining brain cells, strings a few test phrases together. Eyes. I want pictures. Caramel candy is good. You're like this kitten I saw on Tumblr. Let's eat all your candy. Do you feel funny because I feel funny. *\n Yep, that's about as coherent as thoughts get when you're a teenager with a crush!"